Dev.Opera — Web Workers Rise Up! Have you ever been to a page that displayed partially but didn't respond to any clicks? Or a page that froze or crashed your browser? 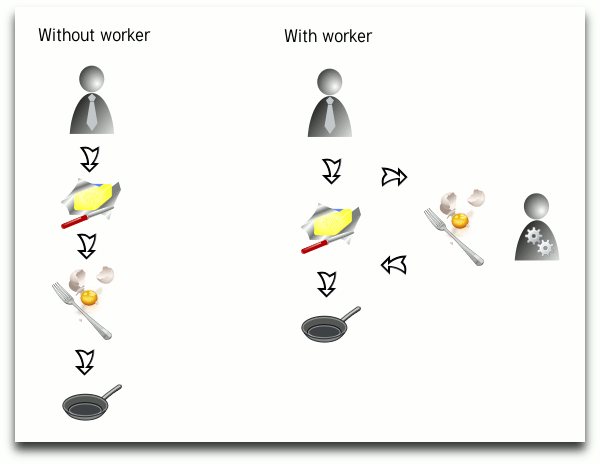 Figure 1: If Web Workers could cook, this is how they'd help make an omelette. Feel free to download this Web Workers demo. Opera is built as a single-threaded browser with support for a wide variety of platforms, so our current implementation of Web Workers interleaves code execution in the single UI thread. Other browsers, however, may have multi-threaded architectures which enable simultaneous execution of code. This is obviously a very simple example, but when you give the worker more complicated tasks to do, such as handling large arrays or calculating points in a 3D space for the main thread to display, it becomes a very powerful feature. The main thing to remember, however, is that the worker cannot access the DOM. In the above example, for instance, we could not call alert() within the worker, or even document.getElementById() — it can only receive and return variables, although these could be strings, arrays, JSON objects, etc. Here's a summary of what Web Workers do and don't have access to. // Yay, I can delegate the boring stuff! Web Workers are particularly suited for situations where you don't want to keep the user waiting while some code is processed. The main thread could concentrate on dealing with the UI, displaying it as quickly as possible, while the Web Workers could process the data, using AJAX to communicate with the server, in the background. Everybody's happy, and all is well in the land of ScravaJipt. Published on 1 July 2010 in Articles. Edit this article on GitHub. Licensed under a Creative Commons Attribution 3.0 Unported license.